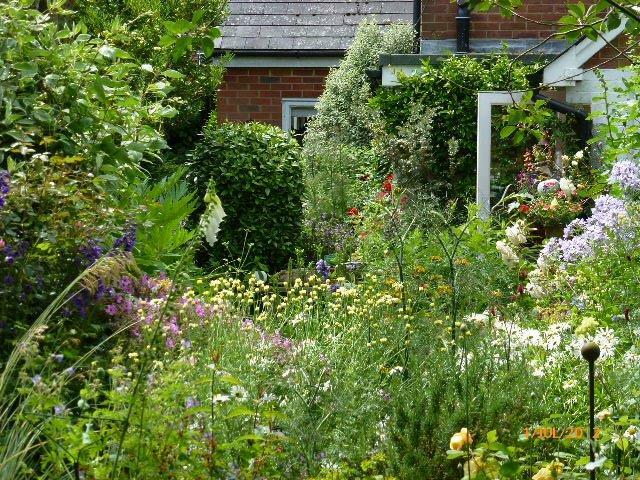 …as part of the 2013 Wadhurst Open Gardens Weekend, on Saturday June 15 from 4 – 6 pm and Sunday June 16 from 2 – 6pm. Eldenhurst – latest, a set on Flickr. …was just one of various bemused comments from visitors about the orange mesh bag – actually full of barley straw – currently breezing around on the surface of my pond as part of my battle against blanket weed and green water. Wiggly Wigglers (www.wigglywigglers.co.uk) sell bags of straw in trios (they are on special offer as I write, the prime time for putting the bags in ponds). By the time it is settled in and starts to submerge a bit, the combination of sunlight and water temperature will make the rotting barley straw release hydrogen peroxide (I think) into the water, which inhibits the growth of algae. You can undoubtedly Google some better science on this. What no one seems to latch on to though is the fact that as soon as they become saturated, the bags sink – out of sight (which is a bit of a relief, actually) , but more importantly out of sunlight – which slightly ruins the whole operation. So I always open up the bags, stuff a small empty sealed plastic bottle right in the middle, compress the straw around it so that it is invisible and then seal the bag up again. The bags (which, by the way, do fade quite quickly in the sun) remain permanently partially submerged. Hey presto. Drowning old ladies in hairnets in my pond. Does the barley straw technique actually work? Well it undoubtedly helps – as long as you hoik out the worst of the algae if it starts to accumulate (if, for example you have to top up your pond with tap water, which encourages algal growth). 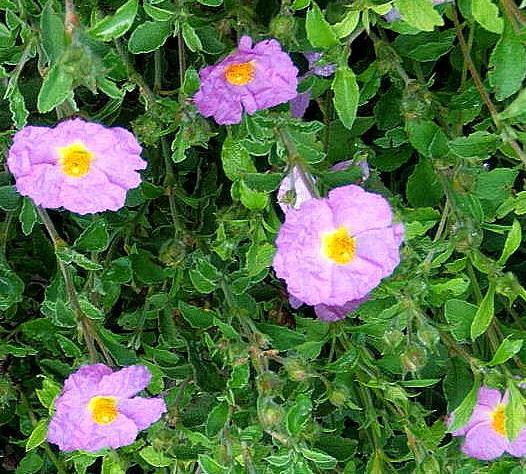 But it also helps to allow between a half and a third of the pond to become full of oxygenating weed. No, this is not – to my knowledge – a reference to yet another RHS tome in the successful series, but refers to my passion for foliage. 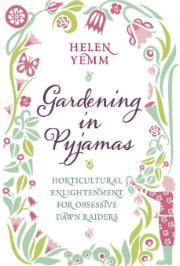 When I was writing Grow Your Own Flowers, shrubs and trees and perennials grown for the sheer beauty of their leaves were, as the title of the book kind of suggests, elbowed aside – allowed barely a mention apart from as mere supporting players for cut flowers, that is. I actually found this somewhat restricting and rather unnatural, since the subtly of a predominently green tapestry has always been a bit of a passion of mine. 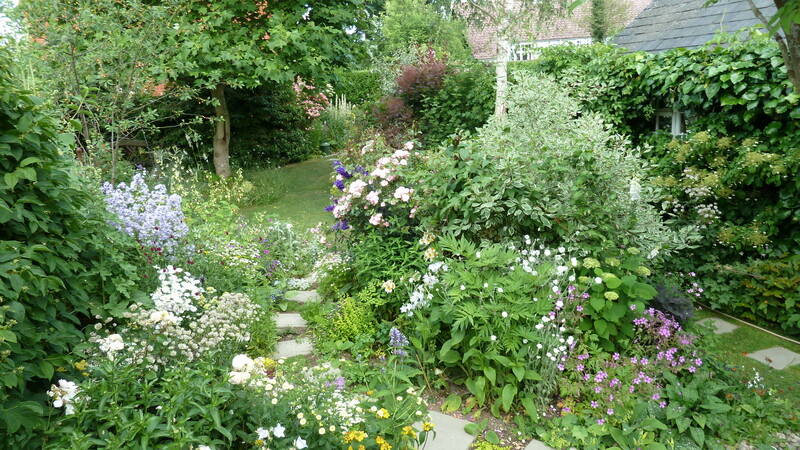 Indeed, one of the parts of my own garden with which I am most satisfied – and for a long season, too – is a leafy and shady area about which I wrote here a couple of years ago when it was just getting going, which I call ‘Torquay’ (for slightly silly reasons – it is all in the previous post…). This week I had cause to look at some of the more recent pictures of ‘Torquay’ (taken some time in late summer last year) when I was composing a reply to a Telegraph reader who wanted help in prettifying an un-plantable shady part of her new garden blighted by a septic tank that previous owners had covered in gravel. 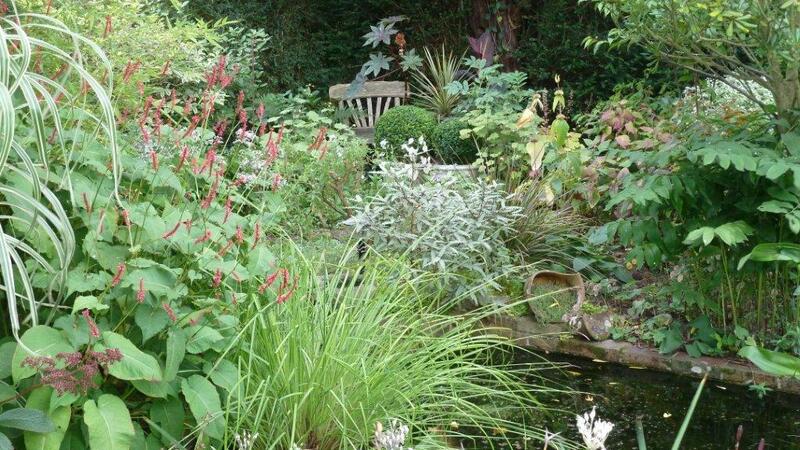 Even in the wide view, above, taken of the area surrounding ‘Torquay’ from the other side of my pond, there is scarcely a flower in sight (the only prominent thing being a huge clump of scarlet Persicaria amplexicaulis ‘Taurus’ on the left hand side). Leaves just do it all by themselves. I am far too idle to map out and name every plant in this other closer view of the potted central area, the population of which I quite enjoy changing a bit each year. 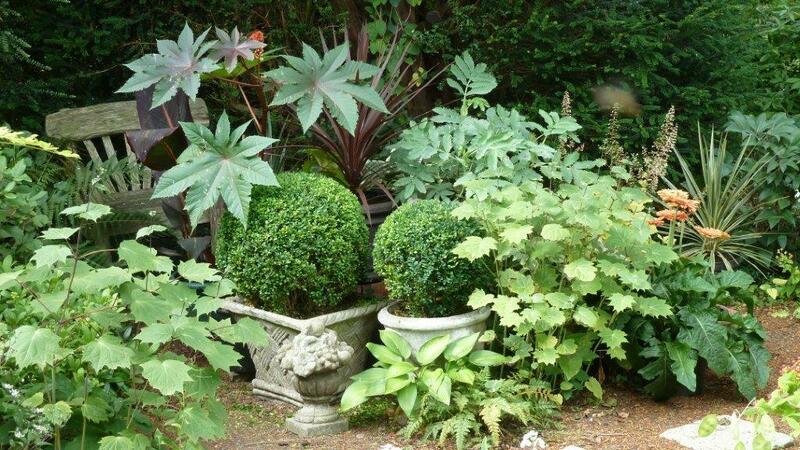 But suffice it to say that tucked around the permanent posh urns of clipped box last summer were Cannas, Ricinus, Melianthus major and a pair of colourful cordylines (that both bit the dust this winter because I wasn’t quick enough off the mark in the lengthy cold snap), a couple of in-the-ground Kirengshomas and various Hostas (the bright little one in the foreground is ‘June’, next to a little patch of self-seeded Corydalis cheilanthifolia). There is also an uninvited and definitely unplanned ‘extra’ in the scene – tucked in on the extreme right end of the group you may notice a stout, flame-flowered, giant-leafed Gerbera. All of us gardening hacks were given one of these in our party bags at the Thompson and Morgan Press Day last summer. Mine looked, it has to be said almost despite itself, quite at home in ‘Torquay’. Amalee Issa has given me a dig in the ribs today. Not a word, not a single word, have I written here in six months – or is it more? – she says. I have an excuse: I am in the thick of it with not just one, but two books. 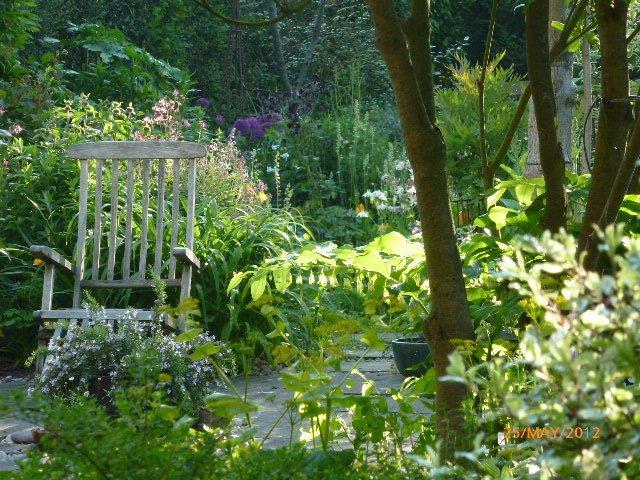 So instead of writing anything pithy – since I haven’t really got time – I will just add a couple more pictures of my garden. Sorry. The new stepping-stone path (replacing a swathe of hard-pressed lawn between a border and a central bed) has worked out even better than I hoped. It has made it possible to walk, effectively, right through the middle of a border that now feels realy chunky – with thyme, camomile and other tiddlers creeping happily between the stones. Loadsaflowers at really close quarters. Lovely. Well OK, actually it probably isn’t. I refer readers to a previous post, namely ‘What’s going on in Torquay‘, an expose of a little area of my garden (in the deep shade of a yew tree) so named because, being a collection of of potted box balls, hostas, spikey things, ferns, melianthus – and also, now, a couple of banana plants donated by a friend – it does somewhat resemble the oddly artificial frontage of a south coast resort hotel (all it needs is an uplighter and hey presto). 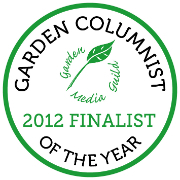 In fact I wrote the piece principally to sing the praises of the plants that, with minimal effort, thrive there. I am very fond of my ‘Torquay’. So the rain to which I refer is not the horticulturally useful wet kind of rain which rarely penetrates the yew canopy – it is foliar. 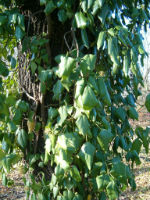 The yew tree is/was infested with common ivy (Hedera helix) – so badly that you could see the stuff waving around out of the top of its (reasonably tough and mighty) host. Last year I wrote about keeping things in my garden ‘in balance’ by cutting back the lush foliage of my border plants at this time. With hindsight – looking at pictures I took – it is clear that many of my plants were hugely over-enthusiastic – they looked as though they had been fed on steroids. I put this down to the fact that it was their first proper season in new homes and they were luxuriating in the newly muck-and-compost-enriched soil (that was originally exhausted and clay-ey). 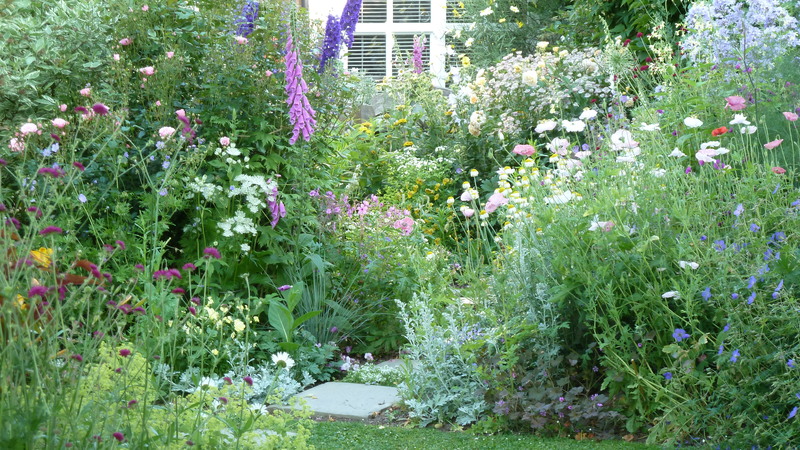 They now look better – sturdy, nicely filled-out and flowering well, aided, (in currently tumbling rain ) by all the invisible corsetry that I put in place to hold them up. A year later and all that original effort and soil improvement is showing with a profusion of flowers and growth in the newer shrubs, and even the old duchesses that were here – the tree paeonies and viburnums and so on as well as the the large established trees – seem to have put on extra weight. You are currently browsing the archives for the Eldenhurst category.